OZEKI WEBOFFICE: Template for page '4060' not found! Create a template for this page! In order to make and receive VoIP calls you need to setup a VoIP service provider connection in Ozeki Phone System XE PBX software. A VoIP service provider connection can be used to connect your PBX to an Internet telephony service to reach external phone lines. Ozeki Phone System XE software ensures excellent technical background for connecting seamlessly to any VoIP service provider worldwide. This step-by-step guide focuses on how to setup a VoIP service provider connection in Ozeki Phone System XE effectively. A VoIP service provider, or Internet phone service provider, is a service provider that offers VoIP Internet telephony solutions for customers. They usually provide the VoIP hardware and services to their subscribers at a monthly rate. VoIP calls are made over a broadband high speed Internet connection rather than over a regular phone line. Why configure VoIP Service provider connection? The configuration of VoIP service provider connection in Ozeki Phone System XE is necessary to be able to make and receive phone calls. These connections make it possible to connect local phone numbers in one or more cities or countries, and they forward these phone lines to the phone systems. VoIP service providers often can provide higher quality services than standard PSTN (Public Switched Telephone Network) systems and they offer more functionality. After setting up a VoIP service provider connection in Ozeki Phone System XE you can initiate phone calls to outside lines over the Internet. For this purpose you can use any of the devices that have been registered in Ozeki Phone System XE. You just need to dial the phone number and the Ozeki Phone System XE sets up the call via the VoIP service provider. Once, the phone is hung up, the PBX terminates the call. Of course, you can also receive phone calls from outside via the configured VoIP service provider connection. * Please choose the VoIP service provider that offers plans best fitting your corporate needs. Once you subscribed to its service, the provider gives you access to its network by providing all connection information: hostname, port, user name and the password. You will need to enter these data into the respective fields in Ozeki Phone System XE during configuration. 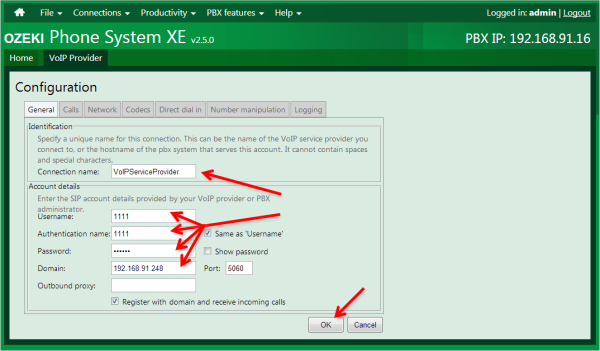 Please follow this step-by-step guide in order to configure a VoIP service provider connection in Ozeki Phone System XE effectively. 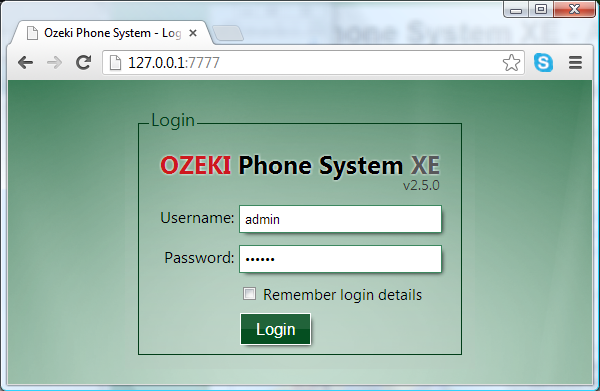 First of all, start Ozeki Phone System XE and log in with your username and password (Figure 1). 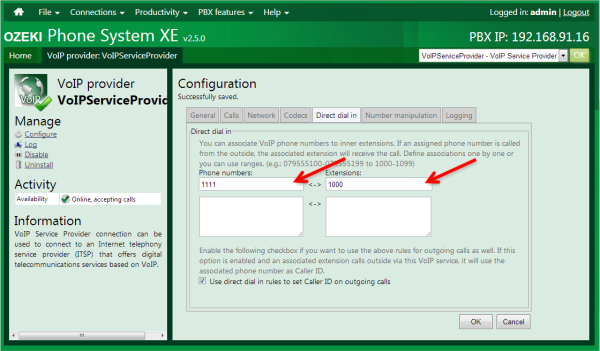 Click on Install next to VoIP Service Provider option in Outside lines section (Figure 2). Now you need to enter the parameters for the installed service provider connection on the configuration form. Please provide the Username, Authentication name, Password and Domain (Figure 4). Please specify a phone number assigned to this service provider connection for inbound calls (Figure 5). 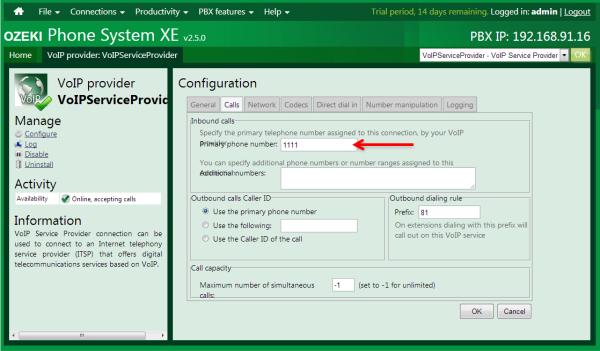 In the outbound dialing rule section you can also specify the prefix (e.g. 81). You can also associate VoIP phone numbers to the inner extensions. If the assigned phone number is called, the associated extension will ring (Figure 6). Figure 8 shows the logs of an incoming phone call. The call is forwarded to the extension 1000 via the registered VoIP service provider connection. It can be seen that the VoIP service provider connection has been configured successfully. Ozeki Phone System XE makes it possible to initiate VoIP calls from any communication devices via a VoIP service provider. The greatest advantage of a VoIP PBX is that it allows to make connection anywhere, anytime, by integrating communication devices. 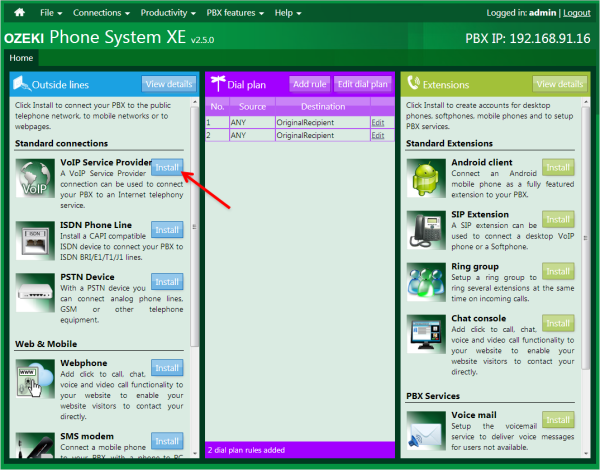 For this purpose, you can setup the selected service provider connection within a few minutes in Ozeki Phone System XE.